The 2019 Contemporary Sculpture at Chesterwood curators are the 2018 Artists-in-Residence, Rick and Laura Brown, seen here working in their Chesterwood studio last summer. They spent their residency making models for their large-scale pieces to be built on-site and installed throughout the woodland walks at Chesterwood this upcoming summer. Click the image gallery below to see Rick and Laura’s work in past Contemporary Sculpture at Chesterwood exhibitions. 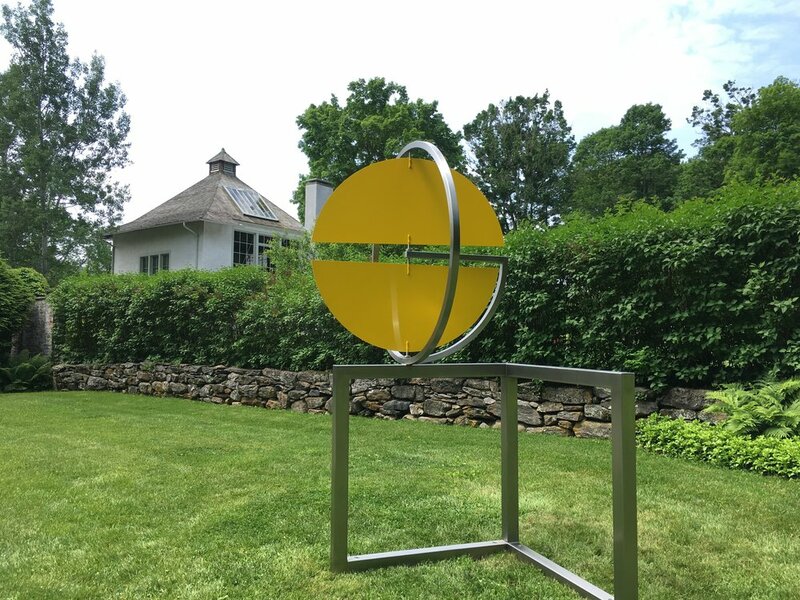 In 2018, Chesterwood is commemorating forty years of exhibiting outdoor contemporary sculpture at Daniel Chester French’s former home and studio in Stockbridge, MA. The very first Contemporary Sculpture at Chesterwood exhibition featured George Rickey’s two stainless steel Rickey sculptures: Two Planes, Horizontal and Vertical and One Up, One Down Eccentric. Forty years later his work continues to be relevant and eagerly sought after for outdoor public spaces and museum collections. 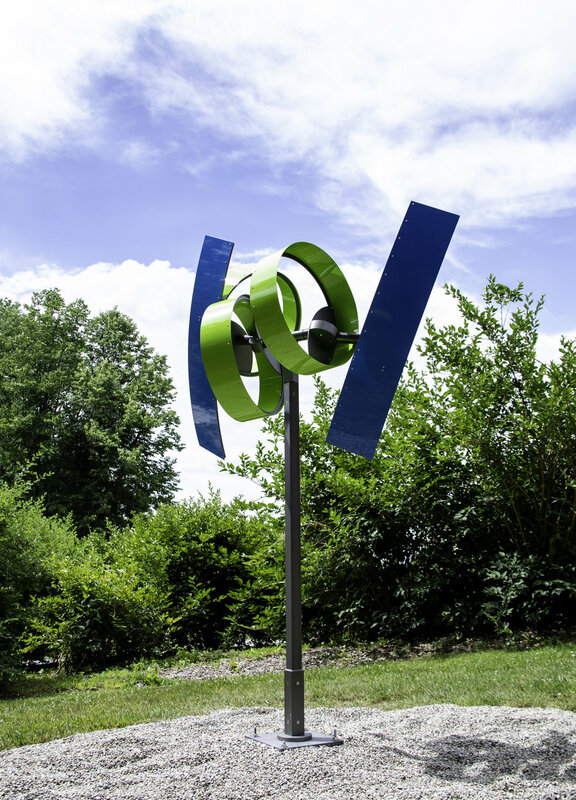 Kinetic sculpture by Rickey and others will be featured in the exhibition at Chesterwood from June 30 – October 8, 2018. Chesterwood is notably one of the earliest venues in the United States to showcase large-scale works in an outdoor setting. The idea for a contemporary outdoor sculpture show was initiated at a Chesterwood council meeting in October, 1974. While the council suggested featuring neo-classical works to reflect the style and legacy of Daniel Chester French, the 1978 inaugural exhibition included ground-breaking abstract works forged from materials such as cement, lucite, and steel. 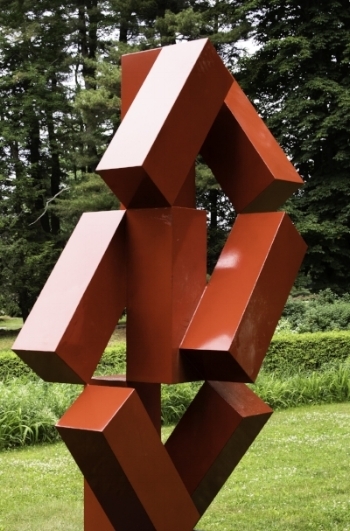 Since then, Chesterwood has exhibited sculpture by almost six hundred emerging and established artists, including Leonard Baskin, Morgan Bulkeley, Herbert Ferber, Glenda Goodacre, Albert Paley, and Richard Stankiewicz. Following the inaugural exhibition, George Rickey contributed works to six more exhibitions spanning the years from 1985 to 2001. The 2018 Contemporary Sculpture at Chesterwood exhibition (free printable map available here) is generously sponsored by the Nancy Woodson Spire Foundation and co-curated by Maxwell Davidson III and Charles Davidson of the Maxwell Davidson Gallery in New York. Founded in 1968, the Maxwell Davidson Gallery has maintained an involvement in and commitment to the field of kinetic sculpture; the gallery has long established itself as a pioneer in the field of kinetic art worldwide and presented Outdoor Kinetic Sculpture, George Rickey, Pedro S. de Movellán in July 2017. 85 x 76 x 87 in. maximum height: 103 in. ; maximum swing: 73 in. height: 171 in., max. 225 in. ; width: 86-1/2 in., max. 162 in. ; radius: max. 123 in. 19-1/2 x 28-1/2 x 36-1/2 in. 144 x 48 x 48 in. 94 x 67-1/2 x 49 in. 108 x 114 x 130 in. 51 x 29 x 32 in. 155 x 22 x 23 in. 147 x 115 x 70 in. 73 x 64 x 24 in. 2017's annual contemporary sculpture exhibition, Out of Site: Contemporary Sculpture at Chesterwood, celebrated Chesterwood as a site for creativity. The exhibition featured the work of 14 artists invited by guest curator Sharon Bates to develop new projects or to adapt existing works that directly respond to the environmental, cultural, and aesthetic attributes of the landscape at Chesterwood. A number of sculptors in the show have exhibited their work nationally and internationally and have been engaged in public commissions. Some of the artists have also exhibited their work at Chesterwood in the past. For others, this was their first opportunity to make site-specific work in an outdoor setting. Artists: Roberley Bell, Roger Bisbing, Colin C. Boyd, Matt Crane, Douglas Culhane, Brian Kane & Michael Oatman, Matt LaFleur, Portia Munson, Derek Parker, Amy Podmore, Chrissy Scolaro, Amelia Toelke and Deborah Zlotsky.